Greetings Readers! All of us have fictional characters that we would absolutely love. Moreover, the way the author/artist portrays them adds to their realism and personality. In simple words, a fictional character is usually someone that we absolutely wish existed in the real world. So what happens if this said character actually comes to life? What if you are able to break through the borders of fiction and realism? What happens, if you start to exist in the world of fiction? 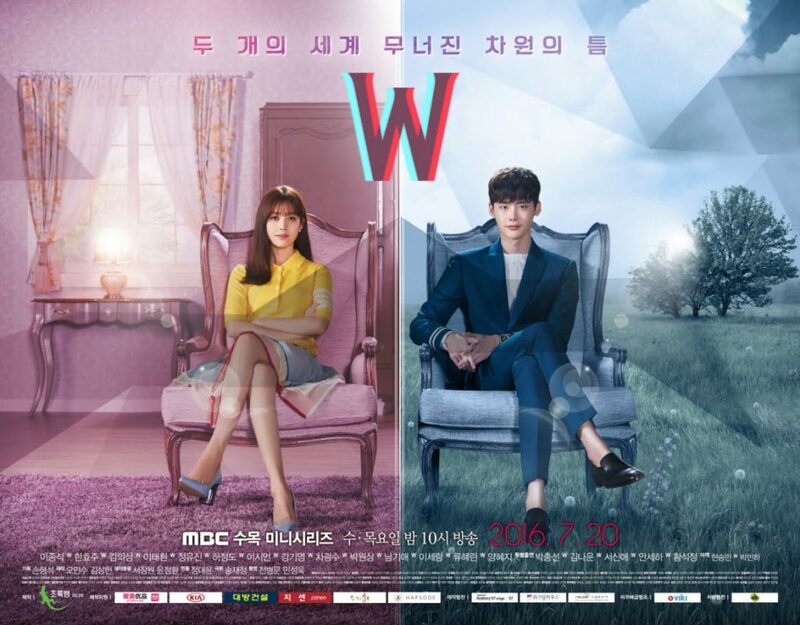 Let me introduce you to such situations through the W : Two Worlds Review. Main Actors: Lee Jong Suk as Kang Chul & Han Hyo-Joo as Oh Yeon Joo. Oh Yeon Joo, a cardiothoracic surgeon goes to visit her father, the author of the famous webtoon ‘W’ after he goes missing. When she reaches his office, she finds the drawing tablet on with a drawing of a dying Kang Chul ( main character ). However, there is no sign of her father. As she rummages through his belongings, she finds herself being pulled into the screen by a bloody hand emerging from the monitor. The next minute, Oh Yeon Joo finds herself on a rooftop beside a dying, bloody man. After successfully saving his life, she realizes that she has entered into the world of the W webtoon and the man she just saved was none other than the main protagonist, Kang Chul. A fairly unique concept, it is surely something everyone has wondered about at least once in their life. I mean, who hasn’t wished for their favorite characters to exist in flesh and blood? But more than that, trying to create an entire series out of this concept takes a bit of work and the producers nailed it considerably. The series is suspenseful and extremely unpredictable as it nears the climax of each episode; just like a good story is supposed to be. Moreover, what seems to add the cherry to this mountain of whipped cream is the working of each character and their reactions to every situation. Oh Yeon Joo’s frantic behavior at every logic of the webtoon, Kang Chul’s oblivious amusement at her antics and the added confusion of the supporting characters really highlights the comedic quota of the series. But what’s a good drama without, well, the said drama? W balances out its comedy with its nail-biting suspense and unpredictability; at least the first half has you wondering what will ensure further. In places where the drama gets too overwhelming, we have the beautiful romance between Yeon Joo and Kang Chul that will make your heart melt little by little, till it is a puddle of sweetness. A shout out to Han Hyo-Joo and Lee Jong Suk for their lovely acting, they were very expressive and smooth with their acting. 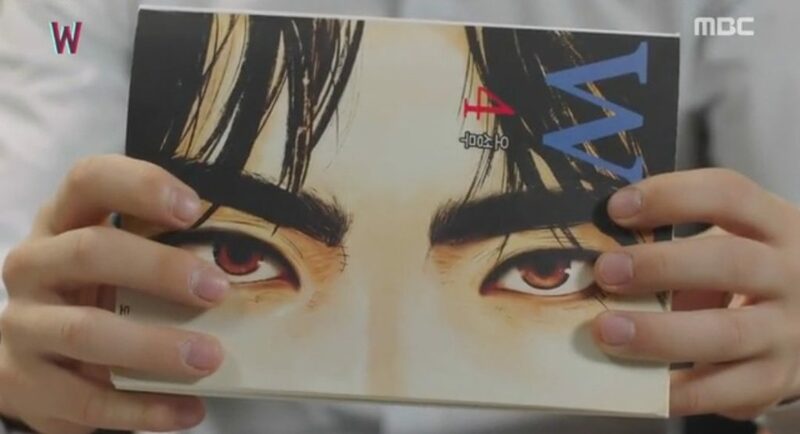 In addition to that, it would be unfair not to mention the amazing people who created the illustrations for the W webtoon often seen in the series. ( I honestly wish I can find this manhua online, but ah, disappointment ). Also, hats off to the producers of W : Two Worlds; the special effects are done too well, especially the transition between the two worlds: real-time Seoul and the webtoon Seoul. Remember how I said it is hard to make an entire series out of this one concept? Well, that’s what I’ll be ranting about. While the producers executed the series well, there are still lots of loopholes and unanswered questions in the drama. Firstly, sometimes Hyo-Joo’s acting becomes annoying; at least to me. Her character is a bit too reactive to everything, which personally I feel could have been dialed down a bit. Otherwise, there is no fault in their portrayal of the characters. Secondly, there is a sudden and major shift in the genre midway through the series. Seriously, it just hits you like a truck in a generic romance manga; sudden and depressing. While the first half is comedic and reveals the working of the two worlds, the second half sometimes either completely contradicts it or makes feeling like a rushed series. There is little to no comedy to relive the tense situations, just a few minutes of thrown in romance which can get boring and repetitive to some viewers. The second half of the series requires a lot of brain work, mainly because there are a lot of hypotheses and concepts thrown in just to bring a conclusion to the show. Spoiler Content Below, Please read at your own discretion. If you wish to skip, scroll below. Kang Chul’s attempts at trying to defeat the antagonist are merely based off his “hypothesis” which seem to never fail. Why? Because of the plot line. Furthermore, shouldn’t Kang Chul’s ability to control the manhua decrease in accordance with him losing his purpose as a protagonist? Why does it work just as well as when he had his purpose? There are many other loopholes, which the story fails to explain the viewers. As a result, it reduces the will to continue watching the series after a while. Another thing that ticked me and countless others of us the ending. I don’t see why Oh Seong Moo had to die in the series. All he did was draw the manhua, and like many others wished to end it for reasons. Sure, the Killer guy ate his face up and he killed people under his influence, but in no way did he do that on his own. So his sacrifice is somewhat stupid and baseless. 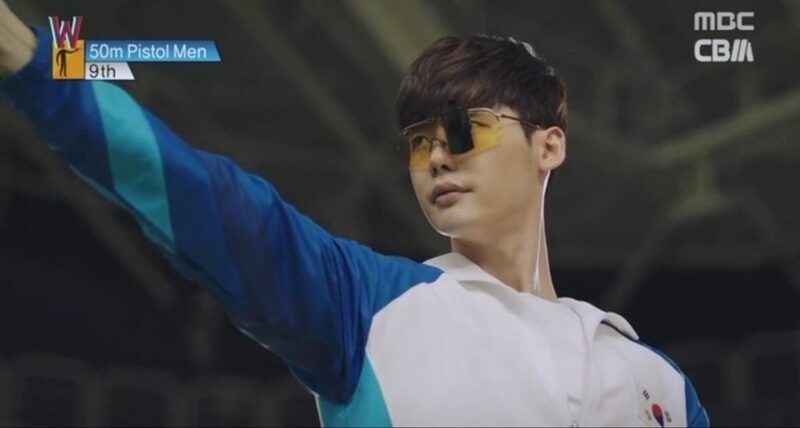 Keeping aside the fact that he could even die as a webtoon character in the first place, what really made me despise the ending was the reactions of Yeon Joo and Kang Chul. You cried and then a few months later we see you both sitting on a bench happy with life. That’s it? I’m sure you could have done better. I honestly feel like Oh Seong Moo didn’t deserve any of this, so I sympathize with him greatly after this series. End Of Spoiler. Please Continue To Read From Here Onwards. 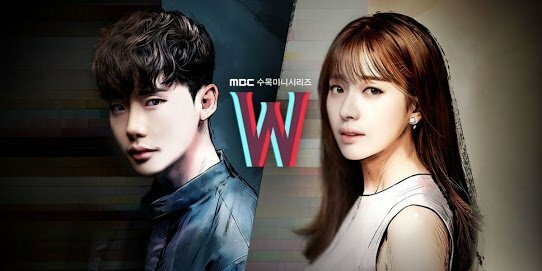 Overall, despite its shortcomings, W : Two Worlds is a drama really worth your watch, at least once. I’d recommend it to regular viewers and new viewers alike. 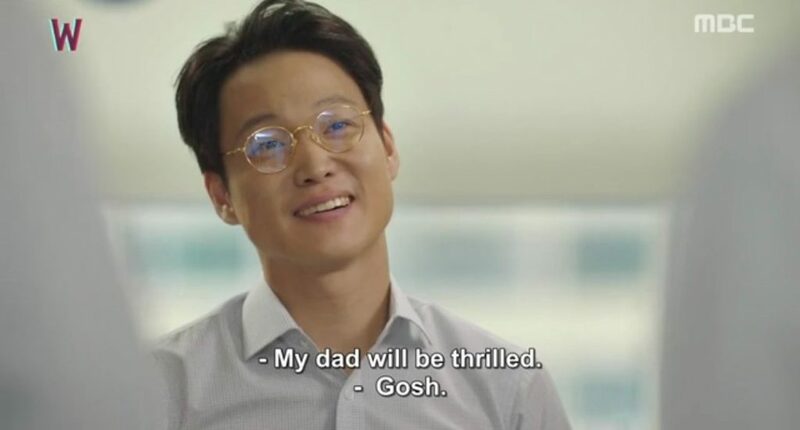 Sure, Lee Jong Suk is one of my favorites, but what really made me enjoy this show was the character Soo Bong. 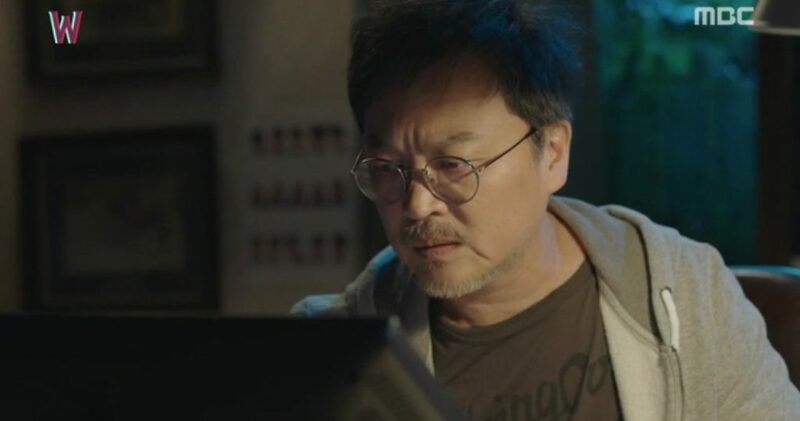 His character is very relatable to any of us; the way we would react if this happened to us is perfectly portrayed to us by Lee Shi Un. Everything, from his horrified expressions, sudden anger at the senior doctor and his fangirl moments make you laugh till you are in tears. His character is what made the second half of W : Two Worlds fairly bearable for me, and which is why I feel I should mention him. The creator of W and father of Yeon Joo, his seething rage, and passion in the drama makes him one of THE best characters of all time. Kim Eui Sung did a commendable job of making me hate him to the point of punching him, yet making me love him just as much. And trust me, his job was way harder than that of the protagonists combined. Moreover, his transitions from a raged man to a caring father are on point. So, he certainly deserves a mention here. Some of us are extremely passionate fans of our favorite media. The types to be the first to read every chapter, the first to comment on it, the first to like it. THE VERY FIRST FAN!!! And also the first to criticize it if need be. Similar to that is Yeon Joo’s passionate teacher Park Min Soo, who was one of the few comedic touches in the show. His interactions with Soo Bong are to die for. Heo Jung Do has done a good job here, and thus, deserves the spot. As I have noted above, it could do better with the plot holes and dreariness of the latter part of the series. But essentially, we can consider it as a flawed yet lovely masterpiece for its wholesome content. I recommend bingeing it the first half and taking it slow for the latter. That way, you can enjoy it to the fullest. If you have already watched W : Two Worlds, please leave a comment below ( spoiler free please ). What are your thoughts on my review? Constructive criticism will be appreciated. Are You A Fan Of Korean And Chinese Media? Then Do Check Out These 5 Korean And Chinese Animations. Or check out my review on Weightlifting Fairy Kim Bok Joo.